The OSCE Office for Democratic Institutions and Human Rights (ODIHR) published a new tool on 9 August 2018 to support the effective implementation of minimum standards for the treatment of prisoners. The resource, produced jointly with Penal Reform International (PRI), was launched initially online. 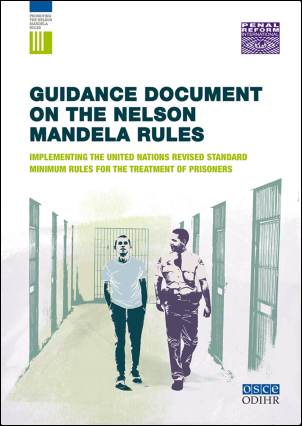 The Guidance Document on the Nelson Mandela Rules – Implementing the United Nations revised Standard Minimum Rules for the Treatment of Prisoners is a practical tool that explores the main human rights issues that arise in prison settings and examines how these can be addressed by implementing the Nelson Mandela Rules. Building on existing international legal and practical tools, ‘soft law’ principles and opinions of authoritative bodies, as well as promising national-practice examples from the OSCE region and beyond, the publication provides comprehensive guidance for the interpretation and effective implementation of the revised Rules in areas such as prison management; safety, security and dignity for all; incident prevention and response; restrictions, discipline and sanctions; contact with the outside world; healthcare; and external monitoring. First adopted in 1957, the Standard Minimum Rules for the Treatment of Prisoners were revised and adopted again, unanimously, as the Nelson Mandela Rules by the UN General Assembly in 2015. The addition of the reference to Mandela was both in reference to the major support South Africa provided in the revision process, but also to honour the legacy of the late South African president, who spent 27 years in prisons in the course of the struggle against the apartheid regime. Download the Guidance Document on the Nelson Mandela Rules here.